These, our inaugural pavers here at 9591 Iris, are in Detroit’s Cass Farms Green Alley, a demonstration project that transformed a scary, deteriorated concrete alley into a pleasant, useful passageway. The new alley uses reclaimed historic brick, diverting it from the waste stream, and water-permeable pavers that let rainfall and snowmelt seep into the water table rather than rushing away into the sewers. It reduces the heat island effect. It promotes recycling – a recycling facility is stationed along the alley – it is pedestrian friendly, with long-lasting high-efficiency lighting, and it also is just plain inviting. Since its opening it has become the core of a lively little neighborhood of shops and businesses. The brass plaque explaining the Green Alley concludes: “Enjoy your walk.” I couldn’t agree more. 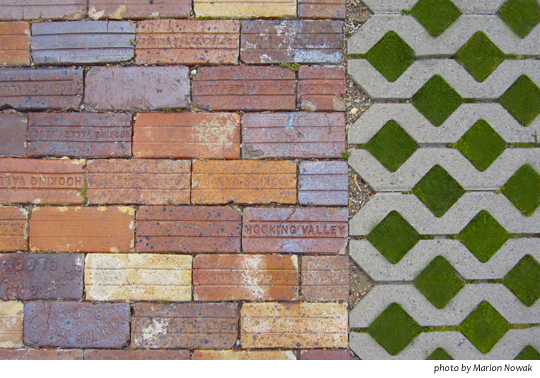 This entry was posted in Uncategorized and tagged Cass Farms Green Alley, Detroit, pavers. Bookmark the permalink.